except that it isn't "perfect", it's just "pretty". Even Hageman figured out rearsets for his bike and I just don't see them here. I guess riding position is just not really important to you. Even Hageman doesn't build these types of bikes anymore. A lot of his more recent stuff looks to be way more useable and a lot more thought is going into how they ride. If you build a bike solely for look, you miss the point of this genre of the hobby full stop. In this case you are just copying a look (without even copying all of it's functionality) that you have no idea if it rides well or not. It's just another imitation chopper that doesn't know it's a chopper because it has low bars. There were people who raced the chain drive XV in BOTT. I betcha you could learn a ton from their exploits about how to properly set up an XV to deliver a great riding experience. - engine fully rebuilt, so its not causing any problems. There was some work put into it, however I don't know if my tech-english is good enough to describe everything. - mono shock - checked, its ok.
A lot of this is stuff you would have done to the stock bike even if you didn't modify it. It's not racing stuff that improves it over stock, it's just making the bike less than junk. you do understand that firmer forks and lower forks on a motorcycle are not always a good thing right? It's more important to have consistent damping and a spring setup for the weight of the bike and rider than it is to have "firmer" suspension. Lowering the front suspension alone changes the geometry - did you sit down and figure out the calculations to make sure you aren't going into dangerous territory? your front dampening needs to match the rear as well - so if you are changing the front shocks, what are you doing to the rear? lowering a bike overall is not a guarantee that it will handle better. In most cases it reduces the clearance you have with the bike leaned over. mass centralization can cause a bike to handle better but that is moving heavier things toward the bottom, not the same thing as lowering. Actually what I am saying is that the bike you choose to model yours after was one of his first attempts, and that his subsequent attempts are probably better bikes. The bike you picked was not one built when he was doing "this kind of work for years", it was one of his first attempts at working with something out of his comfort zone (although it is still a v-twin cruiser so not that far out). Now he has been doing it for years but his bikes look and ride differently. What does that tell you? when you started this project did you email him and try to pick his brain on things he would have done differently or he doesn't like with that attempt? Just assuming he has been doing this for years and everything is hunky dory a-ok is a dangerous assumption. Personally - if you are going to have a cafe racer, it should live up to the "racer" part of the name and be a performance motorcycle. I just think you picked something because it was pretty - not because it was a good performance motorcycle. I am not expecting showbike out of anybody - but I expect awesome handling and a good mechanical setup out of all of them. Last edited by Geeto67; 03-06-2017 at 10:14 AM. "After he crashed at Sears a corner worker later came up to Yamaha’s Ken Clark and handed him a tool kit. “I think this belongs to your rider on the XV920,”"
Geeto67 and BigAl8295 like this. 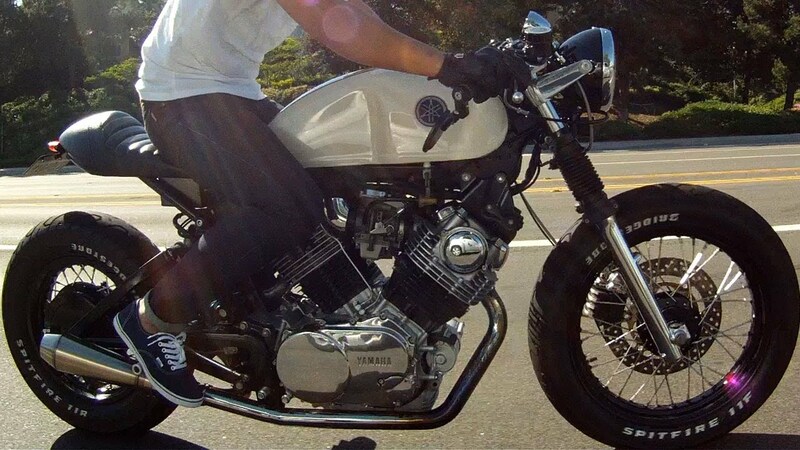 drop the cafe racer and call it a custom. expectation removed., problem solved. or call it a Virago powered Benelli Mojave, that might work too. lol if you google "Benelli Mojave" images, the first three bikes that show up are Viragos! Last edited by TrialsRider; 03-06-2017 at 03:38 PM. PS: I didn't contact Greg H, but I have made some research on his project and C-Bass (similar one) as well. All the time following what they have done.